I had the pleasure of going to Ellen Conlin hair & beauty in Giffnock the other week to try a Dermalux Triwave facial. I was a bit unsure of what to expect, but the whole experience was just lovely. 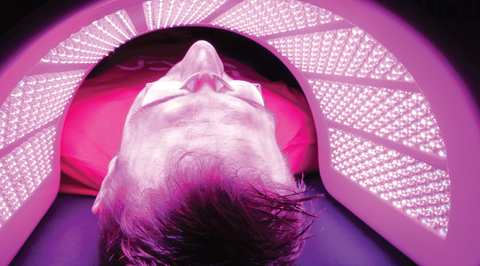 Dermalux is an LED Phototherapy which is a non-invasive skin treatment that accelerates the body's own natural repair processes improving your complexion, fine lines & wrinkles. It can also help heal symptoms such as acne, rosacea, psoriasis and eczema. Three specifically chosen light waves are used - red, near infrared and blue light. ...and then I got myself comfortable on the treatment table. I was nice and cosy under layers of furry blankets. Bliss! The Elizabeth Arden PRO range that I've been trialling was used to remove my make-up and prep my skin for the light therapy. Following this a pair of goggles (not for safety, but more for comfort) were placed over my eyes and the Dermalux light was moved into place. The machine perhaps looks a bit daunting and I can be claustrophobic at times (I'm going for an MRI next week and I'm already dreading it), but I can assure you that this was absolutely fine. It also doesn't make a sound! The light was warm (not hot), soothing and actually very relaxing. Imagine yourself chilling out on a lounger by a pool somewhere lovely and sunny... in fact, the blue light is used to treat Seasonal Affective Disorder. Kirsty then proceeded to give me a shoulder, neck and head massage, followed by an arm and hand massage. It was just divine. She then left me to relax and enjoy the rest of my time under the light (the light is on for 30 minutes). I very nearly fell asleep and only came to when the light automatically switched off! Surprisingly, the effects were immediate; straight away my skin looked brighter and glowing. (It's difficult to tell from the photographs, so you are going to have to take my word for it!). Kirsty had put some Elizabeth Arden PRO Smoothing Eye Serum on my lips, and after the light therapy my lips were look plump and fuller than usual. Yes, it's an eye serum I hear you shout but it's designed for fine lines and wrinkles and so Kirsty explained it's also great for the area around your lips. When Rick saw me after the treatment, he immediately commented on my pout - so it really was an obvious difference! It's the type of facial that would be really good ahead of a big event or special night out. I'd say that my skin is in good condition and I've really been looking after it over the past year or so. However I do still get breakouts, particularly my chin, and I was suffering from one when I had the Dermalux facial. The next day, my breakout had calmed down - it hadn't disappeared so please don't think that you can have a treatment and then you get immediate results after one facial. That said, I think with perhaps two or three treatments then I'd see a dramatic improvement. At £60 it's a bit more pricey than the facials I'm used to having, but the LED phototherapy has upped the ante in the beauty world. (The machine itself costs thousands and thousands to buy!). I'll most definitely be back. the Cosmedocs Clinic Harley Street, such as Botox, dermal fillers, chemical skin peel treatments etc. which can give instant, effective and safe results.